As well as announcing the D500 at CES, Nikon has unveiled its latest FX-format flagship DSLR in the form of the Nikon D5. A few months ago Nikon were keen to point out that the D5 was in the late stages of development and now the camera has been unveiled it becomes clear that it shares many features with its DX-format cousin. Key features include a new 20.8-million-pixel FX-format CMOS sensor that enables the camera to shoot between ISO 100-102400. Enter the Nikon D5’s extended sensitivity settings and you’ll find you’ll be able to push the ISO to an astonishing ISO 3280000. The new Nikon EXPEED 5 image processor also takes the camera to new heights, enabling it to shoot a continuous burst at up to 12fps with the option to increase this to 14fps by setting the camera to its mirror up mode. 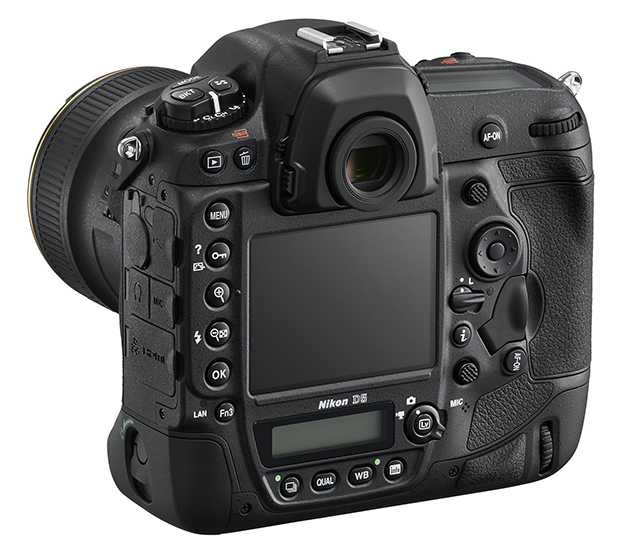 Just like the Nikon D500, the Nikon D5 features a 153-point autofocus system that includes 99 cross-type sensors. Added to this, the Nikon D5 can shoot 4K UHD movies (30p/25p/24p) which is a first for a flagship FX-format model. Elsewhere, new and improved features and functions, such as a high-resolution 3.2in, 2,359k-dot touch screen display, faster wired networks (via built-in Ethernet connector) and wireless networks, and double memory card slots that use the same type of media are present. Interestingly, Nikon has committed to producing the D5 in two versions, one with two XQD card slots and one with two Compact Flash card slots. Claimed to be Nikon’s best-ever DSLR and the camera the industry has been waiting for, the Nikon D5 will go on sale from March with a body-only price of £5729. More information can be found in the press release below and our first-look hands-on review will follow shortly. 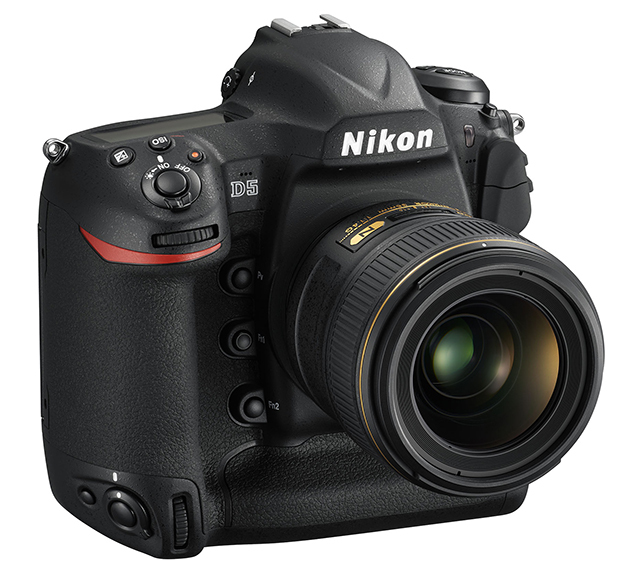 London, UK, 5th January 2016: Nikon reveals the all-new D5, the FX-format D-SLR that gives pros and no-compromise enthusiasts access to astonishing power and precision. No matter how far your vision takes you, this camera is ready to go further. Fully equipped to match your every ambition with phenomenal images, the D5 meets the toughest photographic challenges out there. The camera’s next-generation 153-point AF system offers exceptionally wide coverage whether shooting a race or a red carpet. The highest expanded sensitivity in Nikon’s history makes it truly possible to shoot beyond what the eye can see. And for moviemakers who go to extremes, D-movie now enables users to record 4K UHD (ultra-high-definition) movies in-camera. Next-generation AF: with an incredible 153 focus points and 99 cross-type sensors. AF sensitivity down to -4 EV (ISO 100, 20 °C/68 °F) enables superior low-light performance. Subjects at the periphery are easily detected and vertical shooting is vastly improved due to the implementation of cross-type sensors around the edge of the focusing area. Thanks to a new AF ASIC unit, maximum computing power is allocated to AF at all times. New metering and image sensors: the all-new 20.8-MP FX-format CMOS image sensor and 180K pixel RGB metering sensor deliver phenomenally accurate subject recognition and image detail. Tonal gradations are richer and more accurate, and the new EXPEED 5 image processing engine ensures image quality is unprecedentedly high across the standard ISO range. Power and precision: shoot up to 12 fps with AE/AF tracking, or shoot up to 14 fps with mirror up. AF tracking and viewfinder visibility are vastly improved when shooting fast, unpredictable action. High-performance buffer: capture up to 200 NEF (RAW) or large JPEG images in one high-speed burst – enough to cover an entire 100 m sprint final without taking your finger off the shutter release button. Phenomenal sensitivity – from bright sunlight to astronomical twilight: push the envelope as far as required with an ISO range of 100 to 102400, extendable to ISO 3280000 equivalent at the Hi 5 setting. Experience exceptionally clean performance across the standard ISO range. High-definition 4K/UHD movies: shoot 4K movies (3840×2160 pixels) at 30p/25p/24p in dot-by-dot native pixel crop, which ensures the highest image quality. Shoot Full HD (1080p) video at up to 50p/60p in multiple formats. High-speed image capture and 4x faster data transfer: turbocharge workflow with new Double XQD card slots, a new USB 3.0 port for high-speed transfer of large amounts of data, up to four times faster wireless connection and twice as fast Ethernet connection. In addition to the D5, Nikon is pleased to introduce the new WT-6 Wireless Transmitter (available separately) for efficient high-speed wireless network communications. When connected to the D5, high-speed transfer of image data to a computer* or an FTP server over a wireless network connection is made possible, with a maximum range of approximately 200m*2, making communication significantly faster with support for the new IEEE 802.11ac (2×2 VHT80) standard. Wireless control over the camera from a computer is also possible using Camera Control Pro 2 (available separately).